Nearly two years after tragedy drove Glory Harrison from her Tennessee hometown, she finds herself called back to care for her ailing Gran. The serenity Glory draws from the tranquility of Blue Falls Pond is short-lived as she is haunted by buried memories of the brutal fire that took her husband and unborn child. Glory finds herself assaulted by reminders she’d rather avoid… including courageous fire chief Eric Wilson, the man who saved her life that fateful night. Eric’s silent strength and soft kindness conspire to break down the walls Glory has built around her heart – and each moment in his powerful embrace makes it that much harder to tear herself away. Can she gather the courage to face the dark truths lurking in her past and build a future with the humble hero who made her believe in herself – and in love – once again. Oh my gosh, did I learn a lot when I researched this book. Writing a novel is an interesting process. For every hundred pages of research I do, I might use one fact. But it’s the new understanding of a subject that gives me the overall foundation for the story. 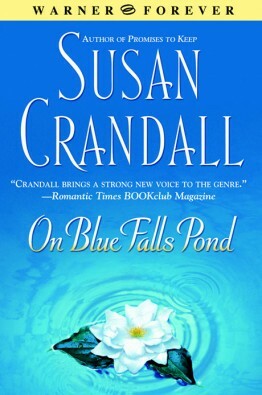 Underneath the lush setting and the love story in On Blue Falls Pond run several issues relevant to our world today: autism, loss of sight through macular degeneration, and domestic abuse. I know it sounds grim, but isn’t at all. This story is one of hope and finding happiness on the other side of tragedy and disappointment. I’ll let you all in on a little known fact, Granny Tula is an amalgam of several strong and gritty women in my own family. I didn’t have a grandmother growing up; both of my parents lost their mothers when they were children. But I had some really, really interesting great-grandmothers. This book didn’t even get a title until the end. In my original file it was simply called by the main character’s name: GLORY. This book was a toughie to get just the right title. We finally did it!